Organic Raw Cacao Chips (8 oz) OUT OF STOCK - DO NOT ORDER! Kona Kava Farm is a family-run farm nestled in the heart of the fertile slopes of Hawaii’s famous Kona Coffee Belt. This area is prized for its micro-nutrients and perfect climactic conditions, producing the taste essences of the tropics. We specialize in cocoa nurtured with fragrant breezes and tropical sunlight, harvested only at the peak of potency, and then dried naturally. 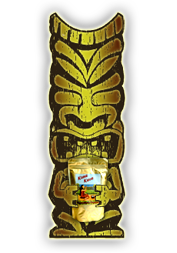 We are proud to bring you this wonderful treat, grown on the same slopes as our prized Kava Kava, so feel free to enjoy. Aloha no! Look for our entire line of Kava Kava products, which include plain organic Kava powder, capsules, concentrates, and more! Ingredients: Organic raw cacao. Organic Raw Cacao Chips (16 oz) OUT OF STOCK - DO NOT ORDER! This is the 16-oz package of our organic Raw Chocolate.